Jetten jettisoned: With the action folded to Jetten on the button, he opened for 200,000 and Krost reraised to 600,000 with two red tens in the big blind. Jetten tanked for a bit before four-bet shoving for over 3.2 million, and Krost called, catching Jetten’s hand firmly in the cookie jar. “I guess I was wrong about that one,” Jetten said as the board ran out . Jetten’s bluff sent him home in fifth place for a $350,000 AUD payday. Mizzi Miz-step: Mizzi raised to 200,000 with , and Jensen looked down at in the small blind. He reraised to 575,000, and like Jetten before him, Mizzi attempted to move his opponent off his hand with a shove. Jensen didn’t waste too much time and made the call for his tournament life. He doubled up when the board ran out , increasing his stack to 5.5 million while Mizzi fell to 950,000. Bad turn for Mizzi: Mizzi had built his stack back up when Kosta Varoxis open-shoved for 550,000 from under the gun. Mizzi reshoved from the button and the blinds folded. Varoxis’ was dominated by Mizzi’s , but the flop made things interesting; although Mizzi’s ace-high still led, Varoxis flopped an open-ended straight draw. Kosta turned second pair with the , and the river blanked out, the falling to double Varoxis up to 1.25 million while Mizzi fell to 1.65 million. Aussie on Aussie action: Varoxis shoved from the button for just under a million chips with , and Krost asked for a count before calling from the big blind with . Krost’s hand held up until the river, the board running out . Varoxis rivered top pair and doubled through the chip leader, taking his stack up to 2 million. Krost was still quite healthy with 5.5 million. Varoxis vanquished: Varoxis finally picked up a big hand, , and opened for 240,000 from the small blind. Mizzi looked down at in the big blind and made an aggressive shove, again hoping to move the initial raiser off his hand. Not this time. Varoxis snap-called and Mizzi saw the bad news. The flop, however, came down , Mizzi pairing his ace. The turn was the , the river fell the , and Mizzi doubled through Varoxis , leaving the Aussie on 525,000 in chips — just over five big blinds. A few hands later, the last of Varoxis’ chips went in the middle with , but he could not improve against Jensen’s pocket deuces. For his fourth-place finish, Varoxis earned $450,000 AUD. Mizzi out in third: Some thought that Mizzi was a lock to win this event with the overwhelming chip lead he brought in to the final table, but his tournament came to an end on this hand. 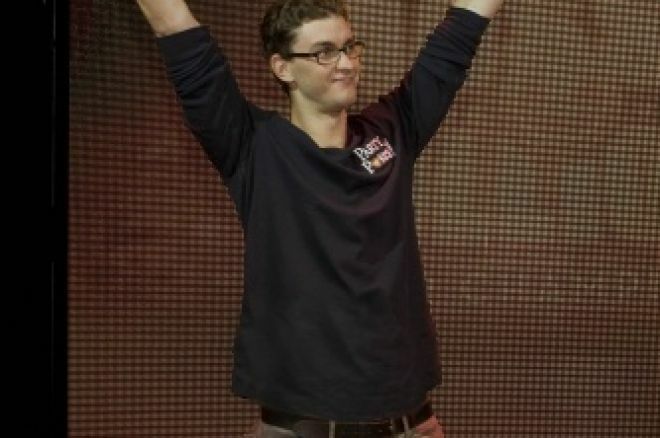 Jensen opened for 250,000, Mizzi picked up in the small blind and three-bet to 775,000. Krost looked down at in the big blind and moved all-in. Jensen insta-mucked and Mizzi went into the tank. Mizzi called and discovered that he was indeed flipping for his tournament life. The flop, however favored Krost, pairing his king. Mizzi was down to two outs as the turn fell the . His fate was sealed as the hit the river, eliminating him in third place for a $715,000 score. “I went from like, running good the first few days to going totally card dead at the final table,” Mizzi said in his post-game interview. Mizzi’s secret nickname: Huggy Bear. Seriously. Krost strikes first: Jensen raised to 200,000 with and Krost called from the big blind with . Krost checked the flop over to Jensen, who bet 250,000 with top pair. Krost check-raised to 700,000, enough to make Jensen let go of his hand. The first heads-up pot went to Krost. That’s all, folks: Jensen opened for 200,000 with , and Krost made the call with . Both players hit top pair on the flop, Krost with the superior kicker. All the money went in on the flop after Krost checked, Jensen bet 225,000, Krost raised to 425,000, Jensen three-bet to 1.1 million, Krost shoved, and Jensen called. Jensen couldn’t pair his kicker, the turn and river falling the , and the . Krost, the finance student from Sydney, with all the chips, captured the 2010 Aussie Millions Main Event and brought the title home. He earned $2 million AUD for the win while Jensen went back to Denmark with a still-impressive, career-high score of $1.1 million AUD. The Aussie Millions on GSN may be over, but you can still get your TV poker fix. New episodes of the PokerStars.net Big Game return tonight on FOX. Check your local listings. Are you following us on Twitter yet? Well why not?